You not only sing the theme song, but you play the clarinet on you're nose like spongebob does. U have the F.U.N song on ure iPod!!! U use spongebob catch phraises as come backs. If u have anymore then please add them. You annoy everyone with"The Laugh"
When you are over 50 and you still watch the show even though your grand kids grew out of it. 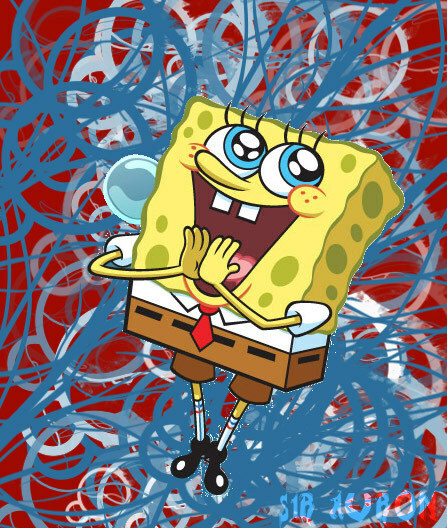 IM A GOOFY GOOBER YEA! UR A GOOFY GOOBER YA! WE'RE ALL GOOFY GOOBERS YEA! GOOFY GOOFY GOOBER GOOBERS YEA! U have all the spongebob stuffs..
spongebob pillow,bed sheet,stuff toys,stickers...hmm..what else.. When: You watch SB more than you work. When you regularly scout ebay for SB collectibles you don't already own and buy them. Everytime you see a new SB food product you just have to try it even though you've eaten it before. It just tastes better with Spongebob or Patrick on the front of the package! When a new SB episode is better than ... chocolate ice cream and cake! When your home looks like a shrine to Spongebob. Oh and my favorite: when you name your pets after SB characters. you use the spongebob's accent all the time. I'M RREEEEEEEEAAAAAAADDDDDDDDDDDDDDDDDDYYYYYYY­YYY­YYY­YYY­YYY­YYY­YYY­YYY­Y! I'M READY! I'M READY! I'M READY! You have replaced the curse words in your vocabulary with Barnacles, Fishpaste, Tartar Sauce, Barnacle Head, and Kelp for Brains.